Nature has been a huge source of interior inspiration this year. Plants of all shapes and sizes have taken over the home alongside a menagerie of playful animal-themed accessories; from kitsch lamps and cushions to candle holders and even decorative animal heads and antlers. But going back to nature needn’t mean turning your home into London Zoo. Subtle accents can speak volumes, and tasteful investment pieces will keep well beyond the flash-in-the-pan palm print cushion. 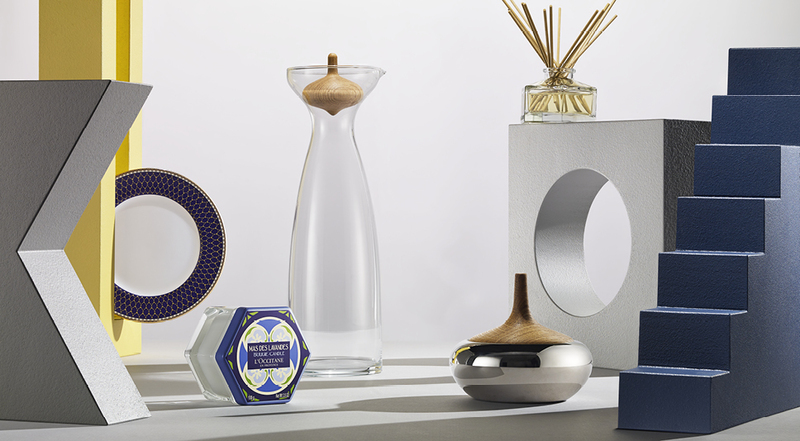 Discover some natural wonders at The Royal Exchange to give your home a subtle update. For a masterclass in minimalist, nature-inspired design, look no further than Scandinavian emporium Georg Jensen. Beautifully made, functional pieces take the form of organic shapes, such as the elegant Alfredo collection glass carafe with an acorn-shaped oak stopper. Meanwhile, the statement HK Bonbonniere Onion takes inspiration from the timeless aesthetic of Danish designer Henning Koppel in contrasting mirror-polished stainless steel and oak. Another brand with artistry at its core is Halcyon Days, a company committed to promoting British craftsmanship and traditional manufacturing processes. The Antler Trellis Midnight dining set is designed by Halcyon Days’ in-house team and hand-finished in gold gilding. It features an intricate pattern inspired by Scotland’s Gordon Castle which will give your table an instant update. An effective and ephemeral way to bring nature into your home is through fragrance – the beauty being that you can always update the scheme as the seasons change. L’Occitane’s Mas Des Lavandes scented candle will instantly transport you to the hills of Provence with its calming lavender aroma, which is also available in a glass diffuser along with other seasonal scents including floral Verbena and Winter Forest. Stock up on some natural wonders and discover all of the above brands and many more at The Royal Exchange.